"You can't put summer in a bottle, but we may have come close! When the weather gets warm we roll out our summer seasonal, Vacationland Summer Ale. 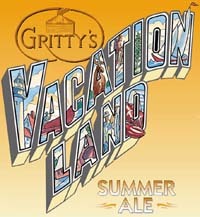 Vacationland is an Extra Special Golden Ale that's light in color but full-bodied, with a snappy hop finish. A bit of extra time in the conditioning tank rounds out and mellows the ale. We use generous portions of pale malt with just a touch of wheat malt to give VSA unique flavor that¹s richer than most summer brews. Cascade leaf hops add a delicate and forward hop character as well. It's the perfect brew for all things summer." --Gritty McDuff's Brewing Co. This summer ale pours a light yellow color with an average, white head. Body clarity is clear, with no carbonation. Fair lacing behind a fully-diminishing head. Aroma is simply of light doughy yeast. Initial taste is a light bitter, strengthening to a medium bitter finish that lasts and lasts. Light on the mouth, it feels watery and chalky with no carbonation.